The FRRL offers multi-week classes throughout the year at no charge for people wishing to prepare for their first amateur radio license or for a license upgrade. 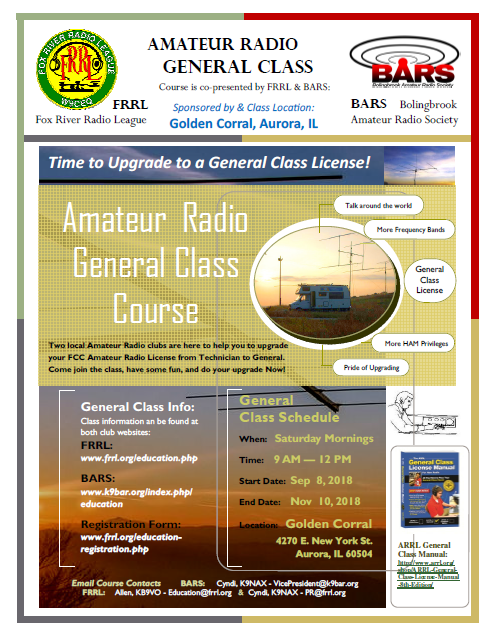 The Fox River Radio League (FRRL) is joining together with the Bolingbrook Amateur Radio Society (BARS) to co-present a NEW – Amateur Radio General Class license training course. This course is a FREE 10 week course. Where you will learn everything you need to Upgrade your Amateur (Ham) Radio license to a General class. This class is designed for hams who have a Technician License and want to upgrade to the General class. Be prepared for both interactive, group and individual study. There will be a VE test license exam on the last week of the course. 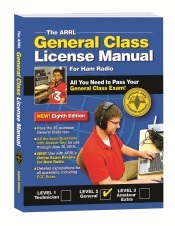 The textbook for the class will be the ARRL General Class License Manual 8th Edition. Be sure you have a copy before the class. Books can be purchased online through www.arrl.org at local hamfests, or other online sources such as Amazon, and Kindle. Additional study material will be given to you at the classes. After receiving your ARRL Ham Radio License Manual book, be sure to review the book and read the first chapter. To be ready to dive into learning at the first class and to ask questions. ARRL offers the Ham Radio License Manual that we will be using in this class. This class is complete. Watch for future classes to be posted in 2019. THIS IS NOT A CRAM CLASS, HOWEVER A good amount of study on your own will be required. For more information on VE sessions see VE Test Sessions. If you wish, to enjoy breakfast too, please come early. Members from FRRL and BARS are invited to come early, eat breakfast, and offer their support.